Moscow has introduced sanctions which will mainly affect imports from Turkey, say Russian analysts. Yet trade between the two countries is largely made up of Russian exports, primarily wheat and gas, and authorities have no plans to bring restrictions in these sectors. Russian President Vladimir Putin has signed a decree imposing a series of economic sanctions against Turkey in response to the shooting down of a Russian Su-24 bomber near the Syria-Turkey border on November 24. By provisions of this decree, according to the Kremlin press service, Russian companies will no longer be able to hire Turkish nationals and visa-free travel between the two countries will be suspended from January 1, 2016. Also, authorities will soon ban the use of Turkish subcontractors to implement state orders, although the government is yet to decide which specific industries will be affected by these restrictions. The Russian statistics authority, Rosstat, figures show that Turkey is Russia’s fifth-largest trade partner. In 2014, trade between the two countries amounted to $31 billion, and in the first nine months of 2015, to $18.1 billion. The bulk of this trade comprises Russian exports. In 2015, imports from Turkey stood at slightly over $3 billion. By the end of 2015, trade between the two countries was expected to reach $23-25 billion, with Russian exports amounting to some $20 billion and imports around $4-5 billion, according to Alexander Knobel, head of international trade studies at the Russian Presidential Academy of National Economy and Public Administration. The lion’s share of Russian exports to Turkey is made up of wheat and gas, for which no restrictions are envisaged. In 2014, Russian gas giant Gazprom supplied Turkey with 27.3 billion cubic meters of gas, making Turkey the second biggest buyer of Russian gas after Germany. In the first nine months of 2015, Turkey exported $1 billion worth of foodstuffs to Russia, with tomatoes and citrus fruit making up more than half the produce. According to Knobel, Russia is unlikely to restrict the import of vegetables ahead of the New Year holidays. 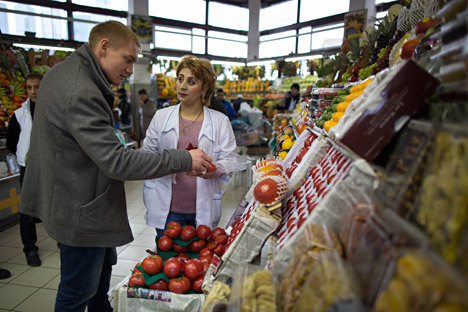 He predicts that Moscow is more likely to step up sanitary checks on food imports from Turkey. Another large segment of Turkish imports comprises fabrics and textiles. Many Russian clothes and footwear retailers place their orders with factories in Turkey. According to Rosstat data, in the first nine months of 2015, Russia imported nearly $514 million worth of fabrics and textiles from Turkey and about $48 million worth of footwear. If the sanctions affect this sector too, Turkish goods could be delivered to Russia via Belarus, said Olga Zhiltsova, managing director of the Marketolog company. The sanctions may drive Turkish construction companies out of the Russian market. “There are quite a few Turkish companies working in the real estate segment, especially in commercial real estate, and we do not rule out the possibility that some of them may quit some large-scale projects inside Russia. Trust in them as partners has been undermined,” Russian Construction Minister Mikhail Men told the RBK news agency. Overall, experts forecast, trade between the two countries is unlikely to drop by more than 50 percent. “I don’t think that in 2016, the reduction in trade will be even as high as 50 percent,” said Alexander Knobel. Having said that, he continued, the biggest losses may come from unrealized future projects. As Turkish President Recep Tayyip Erdogan declared previously, by 2020 trade with Russia could reach $100 billion. This figure was largely based on expectations for large-scale interstate projects, like the Turkish Stream gas pipeline and the Akkuyu nuclear power plant, which are likely to be dropped in the current situation, said Knobel.